Dr. Jennifer Webb is back on the podcast to share outcomes of our Body Kindness research study examining mindful self-care and depressive symptoms in pregnancy and 5 years postpartum. 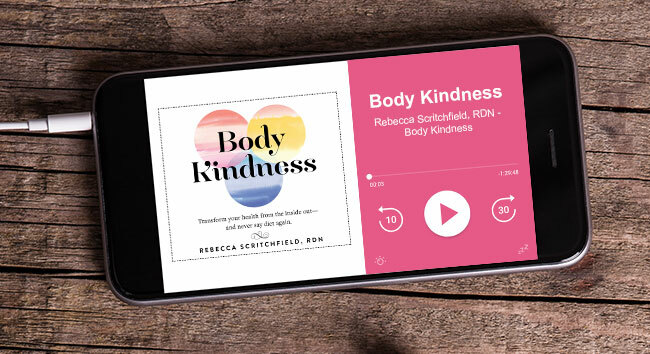 Tune in to learn about the novel outcomes and get some advice you can use — really, it’s good advice for anyone — pregnant or not. We all have a body and we can all heal our relationship to it. Weight stigma, problems with our culture and the biases we carry about higher weight people harms their health. One pathway is through internalized stigma that elevates a person’s worry and anxiety about how they will be treated by the people and the physical spaces in this world (think comfortable seats – or the right to sit!). 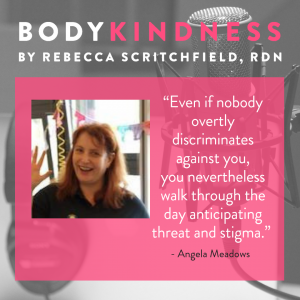 Founder of the International Weight Stigma Conference, Dr. Angela Meadows and I discuss. Psychology research in terror management theory has shown that when people are primed with thoughts of mortality, their behaviors change, but not necessarily in helpful ways. 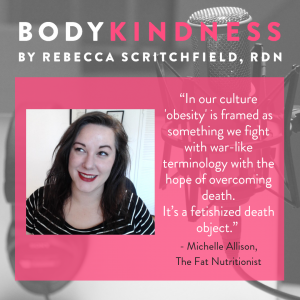 Tune in as I talk with dietitian Michelle Alison (the Fat Nutritionist) about how she was able to extrapolate Ernest Becker’s research from the 1980s to today’s diet culture which is full of “wellness” messages about saving your life with every bite of food, every minute of exercise, and every pill. 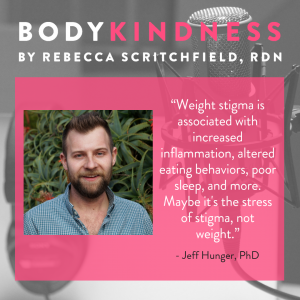 I talk to Dr Jeffery Hunger, a postdoctoral scholar in Health Psychology at UCLA. Dr. Jennifer Webb studies body image in women as part of her research at UNC Charlotte. 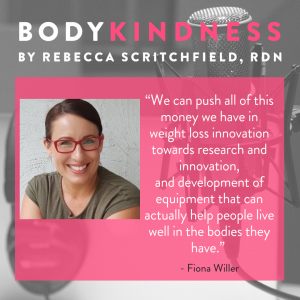 Webb’s lab is currently investigating body image in pregnant and postpartum women with my book Body Kindness. 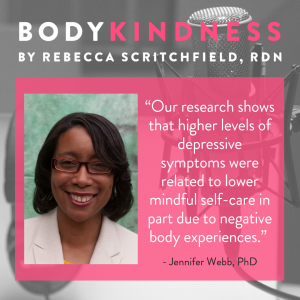 Get insights from Dr. Webb’s current and recent work on Self-compassion and Body Image Healing in this episode.